Sometimes a teacher needs a variety of lessons and activities to choose from relating to the topics taught in the curriculum for different reasons. Sometimes, it’s because you just want to freshen up your plans or because the amount of time you have to teach something changes. Sometimes, it’s because new resources become available that you “just have to implement”. Sometimes, it’s because you need variety due to the personalities and dynamics of a class. Regardless of the reason, I thought I would share a new little project that I created and did with my Child Development students based on the child abuse topic: shaken baby syndrome. Pass out the guide sheet to the video “Forever Shaken” and ask students to complete the bell ringer and pre-viewing column on the worksheet prior to viewing the video. View the video “Forever Shaken” and have students complete the guide sheet. Discuss the guide sheet when finished and share hashtags on the board. Note: Emotions will run high with this topic during discussion. Begin by having students paint their hand blue (the color for child abuse) and press their hand print onto a piece of white construction paper. While the paint is drying, students receive the project sheet for the “Hands are for Holding, Not for Hurting” assignment where students write a concrete poem rough draft about shaken baby syndrome and abusive head trauma. 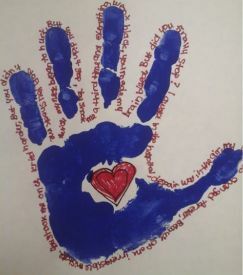 Once the paint is dry, students lightly write their poem around their hand print in pencil. The goal is to stretch it all the way around their hand print. They may have to write smaller or larger to accommodate their space. Once they figure that out, they trace over their poem with a sharpie marker and add the title “Hands are for Holding, Not for Hurting”. Some students chose to add hearts to their hand prints as well. Students orally share their poems and then we hang them around the room and outside my door as visual reminders.